����������� For our design project, we decided to replicate the video game known as �Scorched Earth: The Mother of All Games� where two tanks fire missiles at one another by adjusting angles and power while adjusting for variable wind. ����������� The objective of Scorched Earth is to destroy the enemy tank before your tank is destroyed. Two tanks are randomly positioned on their respective sides on a randomly chosen terrain. Through a trial and error process of adjusting angles and the strength of the tank�s turret, each user can manipulate the trajectory of the bullets to eventually target the enemy tank. With three different weapons of different blast radii and three unique difficulty levels that incorporate variable wind speeds, the users can test their abilities as the most accurately firing tank.� We wanted to recreate this game to allow players to relive childhood memories. ����������� We originally had other video game ideas in mind, but with the help of fellow ECE and housemate, Brandon Richter, we rediscovered this particularly entertaining game that immediately found its way to our hearts.� During the brainstorming processes of recreating this game, we basically decided to implement everything that we successfully completed.� We wanted to randomly draw terrains at the start of each game; however, this would have been too complicated since our code was dependent on the arrays of previously created terrains. ����������� Upon starting the game, a startup screen displays a sample terrain and the two tanks as normally seen during an actual game.� �Scorched Earth� and a difficulty of �easy� as its default setting are also shown on the screen.� By pressing the debounced button C.6, the difficulty levels rotate from �easy� to �med� (medium), �med� to �hard�, and then �hard� back to �easy�.� An easy difficulty level has zero wind effect on the bullets during the game, while a medium difficulty level has a constant wind throughout the entire game, and a hard difficulty level has a variable wind after both players have completed a round of firing a bullet. 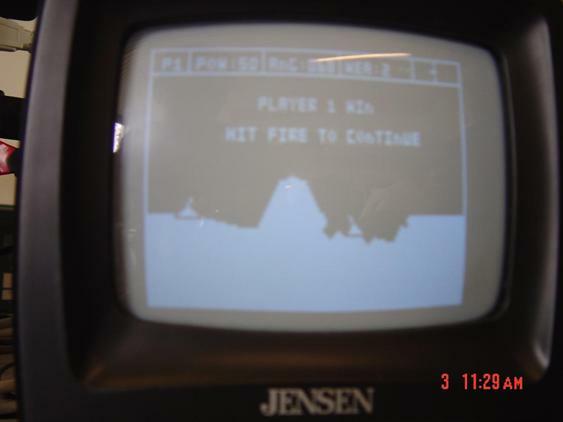 ����������� To begin the game, the user must press C.7 to clear the screen and display a randomly chosen but previously created terrain.� Player 1�s tank will always be located on the left half the screen while player 2�s tank will always be located on the right half of the screen.� Along the top of the screen is an information bar that displays which player�s turn it is to fire, the power of that player�s shot, the angle at which that tank�s turret is pointing, the weapon chosen, the number of remaining shots of that weapon, and the speed and direction (east or west) of wind.� By using buttons C.4 and C.5 to increase and decrease the angle of the tank�s turret and by using buttons C.2 and C.3 to increase and decrease the power of the tank�s shot, the user can adjust the trajectory of their shot.� At the default setting, weapon 1 is displayed on the screen with infinite number of shots.� Using C.1, the user can cycle through to weapon 2 or weapon 3, of which each tank only has 3 and 1 bullets available during each game.� As the user uses either weapon 2 or weapon 3, availability of the bullets, denoted with single pixels, will decrease in number.� The user must then use button C.6 to fire the bullet.� The settings used for the first player to go are saved and the second player can now perform the same procedure with the original default settings that will also be saved upon firing a shot as well. ����������� Once a tank has been hit, a message that reads who is the winner will show up.� To play another game or to simply see the number of accumulated wins each player has since reset, the user must press C.7.� This clears the screen and displays the number of wins that each player has.� �Play Again� is also displayed on the screen, and to do so, the user must press button C.6 to clear the screen again and redisplay another randomly chosen map and random starting positions for each of the tanks. ����������� The standards that we used are the same as those in Lab 4 (Cornell University, ECE 476, Spring 2004): RS170 standards with the NTSC rate.� The RS170 standard includes three voltages for black, white, and sync pulses with an aspect ratio of 4:3.� The scan frequencies of the horizontal and vertical sync pulses are 15.75 KHz and 60 Hz respectively.� The standard includes 525 interlaced lines per frame with 60 frames per second; however, we will be outputting a duplicate line for new line created. ����������� The foremost important copyright that must be addressed is the person(s) who originally created the game known as Scorched Earth.� Unfortunately, since we are not able to find the names of those who deserve our appreciation, we can only publish the official website for the game: http://www.classicgaming.com/scorch/.� However, must also thank Cornell University�s Professor Bruce Land for providing the basic code for NTSC video, obtained from Lab 4 as previously mentioned.� Professor Land also provided the basic code for sound implementation from the STK500 to the audio input on the back of the television.� We must also obviously thank Professor Land for the knowledge that we have gained by taking his course (ECE 476). 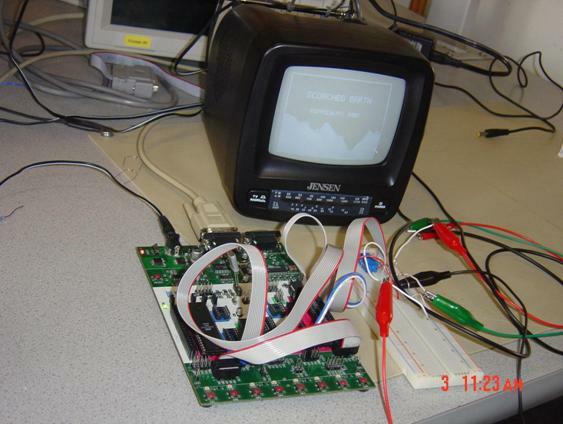 ����������� Since our final project is a video game, our sole hardware necessary was the microcontroller unit, located on the STK500, pushbuttons to operate the game, also located on the STK500, and the video digital to analog converter shown in the design schematic below.� We used PORT C for the pushbuttons and PORT D for the circuit to implement the television.� The circuit was connected was wired to the yellow connector on the TV using clip leads and a RCA phone jack. The TV was set to video input. Since we were able to use Professor Bruce Land�s video generation code, all we had to do was write the code for the game and were able to use the video generation code to output all our date.� In general the code was pretty straightforward to write and we didn�t have any major problems with it.� Our biggest problem was timing restrictions which forced us to break up our output into multiple frames/states so that we would not get artifacts. 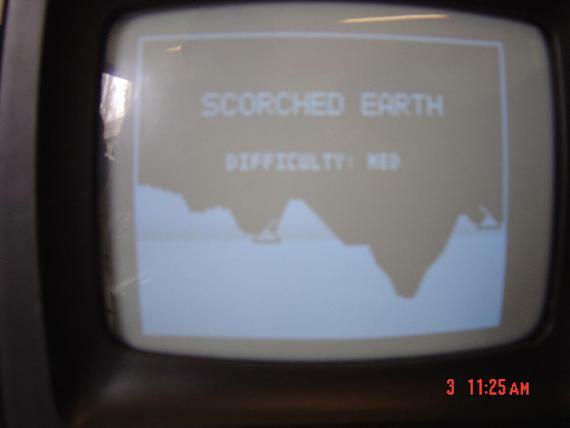 The start screen has the game name, �Scorched Earth�, and a map with two tanks as the background.� At this screen you are allowed to choose the difficulty of the game.� There are 3 difficulties: Easy which has no wind, Medium where wind is randomly generated but doesn�t change for the rest of the map, and Hard where wind changes after each player has shot. One of the trickier parts of the code were erasing the screen and drawing a new map. It took us a few tries to figure out how many lines we could draw or erase in each frame without causing artifacts to occur.� We finally decided on only drawing or erasing 3 lines per frame to ensure that no artifacts would occur.�� We have 5 pre-generated maps that have been stored into memory of our cpu.� We used a random number generator to randomize which map would be chosen.� We also used a random number generator to randomize the starting location of P1 and P2. We used a random number generator after drawing the maps to randomize which player gets to go first.� At the start of the players turn, the player is allowed to change his power, angle and weapon, and fire when he feels he is ready.� The values for power went from 0 to 99, the values for angle go from 0 to 180 and the weapon is cycled from 1 to 3.� We debounced all the buttons used to increment/decrement the power, angle and weapon.� We used a timed increment so that power and angle would be changed by one every quarter second.� First we had it such that each button press would result in a change of one, but we found it tiresome to press a button 15 times, and it was much easier just to hold the button down.� And for the weapon since it was only cycling through 3 possible values, we just decided to leave it as a simple debounced button where each press increments the value by 1.� Also weapons 2 and 3, which are considered super weapons, have a limit on the number of shots available.� Weapon 2 only has 3 shots while Weapon 1 only has 1 shot. Once the bullet is fired the trajectory of the bullet is calculated, how this is done is explained in the next section.� Also you are not allowed to fire if you have no more shots left of the selected weapon. First thing we did to determine the trajectory of our bullet was to divide the power of our shot into x and y components (xpow, ypow) using the sine and cosine functions.� We had a start position (xpos, ypos) which was at the top of the turret of the tank and we changed these values by a factor of the power (xpos = xpos+xpow/25, ypos = ypos-ypow/25). Once we changed the position variables we changed the power variables, the xpow would be changed by a factor of wind/25 and ypow was reduced by one every frame to account for gravity.� This caused us to skip a few points because at our highest power of 100 it was possible to skip 3 pixels ever frame and it was possible that our shots would skip over the top of the tank or not hit the top of the terrain but instead hit somewhere lower.� In order to correct this we scaled our changes by � so that we wouldn�t skip any points, for example xpos now equaled xpos+xpow/100 and xpow = xpow + wind/100 and ypow = ypow - �.� This ensured that at full power we would only be moving one pixel, and though this increased the time it took for the bullet to travel from one point to other, it made the point of impact much more accurate.� Also the xpos and ypos variables were stored into other variables (prevx,prevy) so that we know what the last position of the bullet was and delete it. We decided to make the left and right walls absolute boundaries.� If any of the shots hit these boundaries that players turn would end, we assumed that if the shot has passed the edge of the screen that it was shot too far and thus will not hit.� The top of the screen however was not an absolute boundary, any shot went higher had a chance of coming back.� We just stopped our program from drawing new points or erasing old points if the bullet went higher than the top of our screen, and we resumed drawing and erasing once the bullet re-entered the screen.� This allows the player to take high shots to get over hills that they might be next to without worrying about hitting an absolute boundary. The round ends when one of the tanks is struck by the bullet.� Regardless of which player shot the bullet, the player whose tank is hit loses and the other player wins.� At this point we print out a message letting the players know which player has won the round.� Then by pressing fire you go to another screen, where you have the option of changing the difficulty, this screen also shows the number of games each player has won.� By pressing start at this screen you can start a new game. At this point all your weapons are refilled and once again which player starts is randomized. The final part of our code that needs to be talked about is the sound effects.� During the shot when the trajectory is being calculated we have a note which increases in pitch every quarter second. The timebase of quarter second was achieved by using a variable to count up to 15, and since each time it increments corresponds to one frame and each frame is 1/60th of a second, the counter hits 15 at approximately quarter second.� We set OCR0 to 60 and ran timer0 without interrupts enabled on a prescaler of 100, to generate our initial note and every quarter second we incremented OCR0 by 1, to increase the pitch and thus make our sound a little more realistic.� Also when a player tank is hit we have a much higher pitched sound with an OCR0 starting and 195 and going to 193 in order to create a sound for three-quarters of a second to simulate the explosion of a tank getting hit.� Though since I, Karthik, did the sound in my free time and am not musically talented the sound is most likely quite a bit lacking in their effect. As I mentioned earlier in this section we had no major problems with this code.� The only part of the code that was tricky to figure out was trying to keep the artifacts from occurring when our bullet crossed our boundaries.� When the bullet left the top it would erase part of the line or the last bullet location drawn would not be erased.� This was a little tricky for us because we tried to play with which point we called our boundary, this was usually the pixel before the actual line itself, and we still ended up with the stray unerased bullet.� We finally fixed this problem when we noticed that when we ended the turn due to the boundaries we would not erase the previous point because we would be skipping a state when compared to if the bullet had hit terrain.� Once we figured this out it was easy to make the change and remove the stray unerased bullet point.� Other parts of our code such as timing constraints for drawing the map, though they weren�t tricky took some experimenting to make sure that they were efficient. 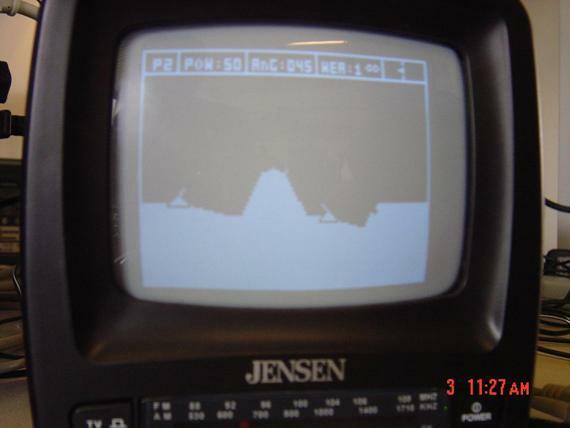 Most of our code executes with no delay.� The only part of our code where you might see a bit of delay is in our drawing of the map or clearing the screen, since each of this program is divided over approximately 42 frames which equal three-quarters of a second you will see a scrolling effect when the screen is being cleared or a map is being drawn.� This is the only part of the program where the desired output isn�t output to the screen all at once but instead is broken up into smaller pieces over a lot of frames, and therefore the only part where any delay recognizable by the human eye can be seen. ����������� We enforced safety in our design by following the applicable standards for NTSC rate and RS170.� By also carefully wiring our circuits and using low voltages, no one can be harmed by our project.� Players of the game will use the pushbuttons, located on the STK500, that cause no threat to safety.� By adhering to the no food and drink policy in the lab, we also prevented careless accidents from occurring.� Since our program was mostly software based and we did not create any RF interference or CPU noise, our project did not interfere with any one else.� Our project is usable by anyone who has the ability to watch a television screen and push buttons.� However, the ability to logically determine how to win a game by firing a missile at the enemy tank by adjusting the tank�s power and angle would also greatly help in using this project. ����������� We were completely satisfied with our project on all levels.� Everything that we planned to implement within the video game was achieved: a startup screen; the option to choose difficulties of no wind, one wind, or variable wind throughout the game; randomly chosen terrains, tank positions, and starting player; the ability to increase and decrease the power and angle of the tanks; the ability to choose one of three weapons that created different blast radii in the terrain and two of which that were limited in number; the ability to save each player�s most recently used angle, power, and weapon settings; a line that indicated the strength and direction of the wind; and a �Play Again?� screen that would allow the players to change the difficulty level again.� As far as we know, the only thing about our project that we would have changed was the implementation of Sega Contollers to play the game.� This is extremely simple and given the access to controllers and a little more time, we would have completed this task as well. ����������� As stated earlier in this report, we conformed to applicable standards as well as possible.� The standards that we used are the same as those in Lab 4 (Cornell University, ECE 476, Spring 2004): RS170 standards with the NTSC rate.� The RS170 standard includes three voltages for black, white, and sync pulses with an aspect ratio of 4:3.� The scan frequencies of the horizontal and vertical sync pulses are 15.75 KHz and 60 Hz respectively.� The standard includes 525 interlaced lines per frame with 60 frames per second; however, we will be outputting a duplicate line for new line created. ����������� Also stated earlier in this report, the foremost important copyright that must be addressed is the person(s) who originally created the game known as Scorched Earth.� Unfortunately, since we are not able to find the names of those who deserve our appreciation, we can only publish the official website for the game: http://www.classicgaming.com/scorch/.� However, must also thank Cornell University�s Professor Bruce Land for providing the basic code for NTSC video, obtained from Lab 4 as previously mentioned.� We must also obviously thank Professor Land for the knowledge that we have gained by taking his course (ECE 476).� Professor Land also provided the basic code for sound implementation from the STK500 to the audio input on the back of the television.� We did not use code in the public domain nor did we reverse-engineer a design.� We did not have to sign a non-disclosure to get any sample parts nor do we have any patent opportunities for our project since this is indeed a video game that recreated the idea of another person(s). Our video game has not impact on society that will produce any negative effects on the safety, health and welfare of the public.� Given that we are using a television to display our game, we are following all protocols compliant with NTSC and RS170 standards. If there was ever a conflict of interest between the group members, such as a difference in opinion as to what additional features should be added to the game (should missiles reflect off of the side walls), we rationally discussed our problem and reached a solution.� We did not have any conflicts of interest outside of the group. During the creation of our project, we sought advice from our teaching assistant, Vladimir Kozitsky, Professor Land, and others who we felt could contribute to a more successful final project.� We accepted all criticisms as honest and altered our project as we saw fit.� All of the persons who contributed their thoughts have been acknowledged and thanked. 5.� to assist colleagues and co-workers in their professional development and to support them in following this code of ethics. We offered our support to other teams by offering constructive criticism and advice that would help other groups succeed.� We did not break any of the rules discussed in the IEEE Code of Ethics. ����������� Our project will have a tremendous societal impact since playing this game will bring create hours upon hours of video gaming pleasures.� Reliving many childhood memories is priceless.� There are very few safety considerations.� If we decide to encase the breadboard and the exposed wires, there will be no risk to health in any way. 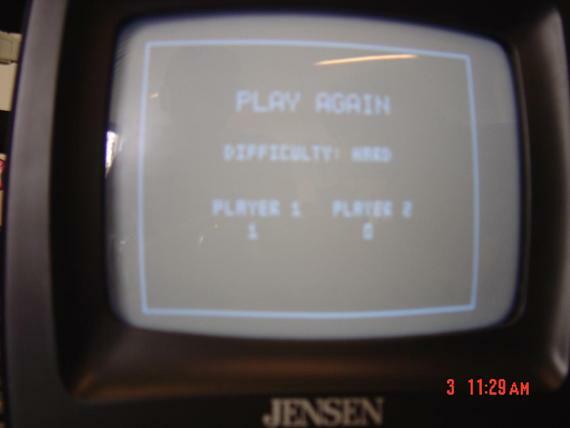 �Furthermore, since we are using the RS170 standards with very few modifications, there is no need for problems such as epilepsy.� Two humans will be able to play the game; each player will alternate firing the tank until one of the tanks has been destroyed.� The user will solely need the ability to press buttons on a keypad in addition to being able to turn on the microcontroller unit and the television.� The ability to make appropriately adjust the strength and angle of each shot will also help in winning at the game.� The copyrights for this game have yet to be found but will be properly acknowledged soon. 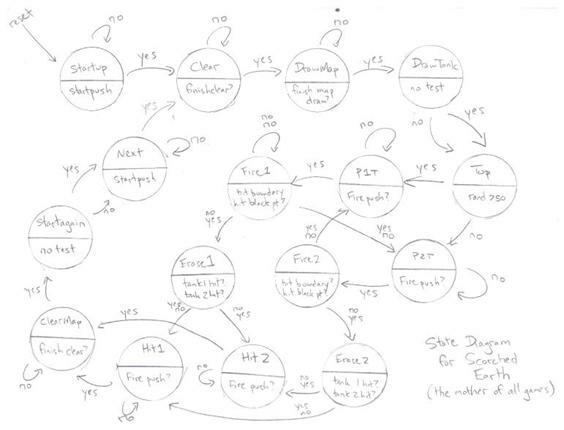 The drawing below shows the state diagram used for our video game.� Nested within this state diagram was the state diagram for button debouncing, shown later in this section. The following diagram illustrates the basic schema used to debounce buttons used during the execution of the game.� Two of the eight buttons used are shown below, but the same basic schema was used for the remaining six buttons.� We used this schema for use of the buttons while playing the game, as well as C.0 during both the startup and game over screens to change the difficulty settings. During the entire design of our project, we split up most our tasks equally.� Once the project was complete, Karthik implemented the sound of the video game during his spare time.� Since he also has more experience in programming and thus has a stronger background, Karthik was therefore slightly more responsible for creating some of the program code.� However, to compensate for this, Vijay was responsible for writing a slight majority of this written report. //NOTE that v1 to v8 and i must be in registers! ��������������������������������� // change the location and power of the bullet, play a note. �������������������������� // make changes to power and location of bullet.